Since 2008, EDF Climate Corps has worked with hundreds of organizations to cut energy costs and curb carbon emissions. Along the way, we've identified what does and doesn't work, reporting the common barriers to energy efficiency and the most powerful strategies for breaking them down. Built on years of industry insight and research, you can use this Smart Energy Diagnostic Survey as an insightful benchmarking tool to better understand and drive your organization's energy management progress. 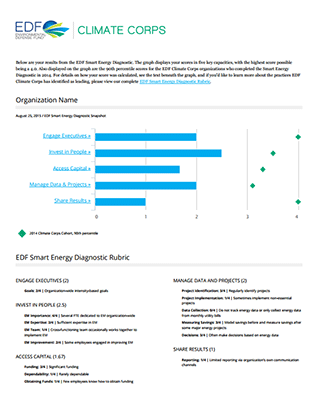 This Smart Energy Diagnostic survey is designed to help you identify bottlenecks within your organization and target key areas for improving your energy performance to cut costs and emissions through smarter energy management practices. Your results are kept confidential and will be available as soon as you complete the survey.